If your ski resort dream includes an Alpine backdrop appropriate for a muesli box, and a pedestrianised old stone village centre, then Courmayeur is for you. Everywhere you look it's charming. From the soft glow of old street lamps to the blazing fires within the chalets, enticing you in for some of the valley's liveliest après-ski. 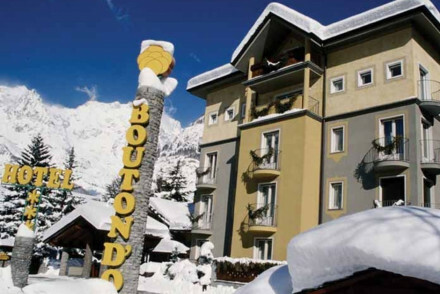 Accommodation wise the best places to stay in Courmayeur range from the budget Bouton d'Or to the luxurious Au Coeur des Neiges chalet complex. As well as the 41kms of piste and 100kms off piste Courmayeur has some great cross country skiing options. Some of which become walking or mountain biking trails in the summer months. Until 1965 when a tunnel between Chamonix and Courmayer was opened, this was an Alpine spa town. Which is probably why Courmayeur looks so different to some of the more purpose built ski resorts. But now the après-ski is fantastic - especially for skiiers who love great food! Heston Blumenthal comes most years to host the Mountain Gourmet Ski Experience. In fact lots of Italians aren’t actually here to ski at all, so even if the resort looks busy the slopes might not be. Courmayer is an easy weekend option from the UK and other European destinations, and an extremely popular choice for Milanese of a Friday afternoon. Just 5kms from town, the Thermal Baths of Pré-Saint-Didier are a year-round attraction, wonderfully relaxing with spectacular views of Mont Blanc. If you like to mix a bit of sightseeing and culture into your skiing holiday, visit the Museo Alpino Duca deli Abruzzi and find out about the region's dramatic history. The majority of Courmayeur's runs are beginner or intermediate level, but this is also a great base for experienced skiers who want to ski the rest of the Chamonix Valley and the exhilarating Vallée Blanche. 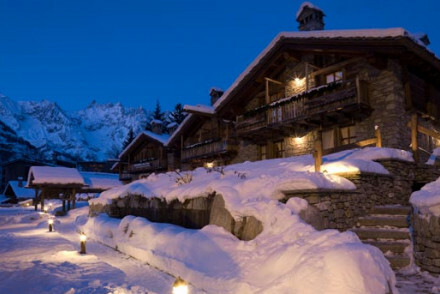 If you're looking for a traditional ski chalet, one with great fur rugs, exposed beams and giant roaring fires, one of the best places to stay in Courmayeur is Au Coeur des Neiges. As well as rooms in a rather large chalet, there are also smaller chalets - so it's like a chalet community. This is perfect for families as some of the chalets are like homes from home. The spa and restaurant both have excellent reputations and you're only two minutes from the cable car. Villa Novecento is a good choice if you're looking for somewhere with atmosphere. This charming villa looks glamorous from the outside, and has a rustic elegance on the inside. Think oil paintings, Baroque decorations, and heavy fabrics - but in chintzy patterns. Locanda La Brenva is a charming alpine property with spectacular mountain views and ten characterful rooms: think exposed beams and wood floors. The restaurant serves contemporary regional cuisine. 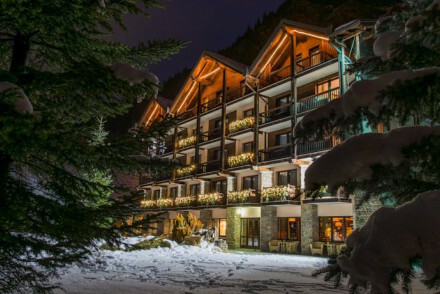 Nestled into the mountains with views of Mont Blanc’s peak, QC Terme Monte Bianco is a beautiful boutique hotel with a traditional, alpine flavour and 57 rooms - most with balconies. The hotel also has a well-known spa and hot tubs and two restaurants. 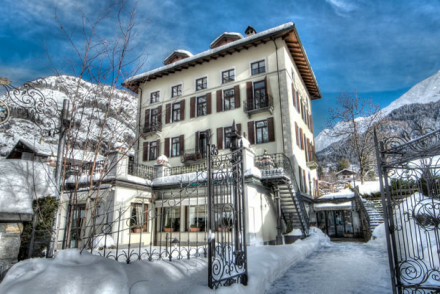 The Mont Blanc Hotel Village is in La Salle, at the foot of Mont Blanc and is a wonderfully traditional hotel with plenty of wood and stone detailing. There are 40 rooms - all with spectacular views - and a good restaurant priding itself on its local sourcing. There’s also a heated pool and jacuzzi and a spa. If you're on a budget book the Bouton d'Or. Simple and cute, this hotel has views worth a lot more than the £70-odd per night the rates start from. The Hotel La Granges is a traditional property, with plenty of charm and wonderful rural views (when they’re not covered in snow). 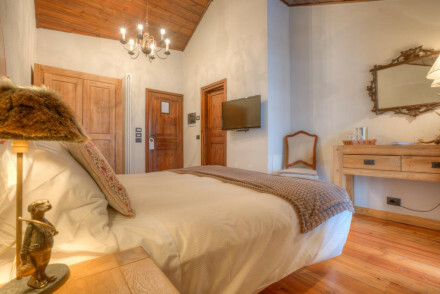 There are 12 simple rooms and an atmospheric restaurant serving exceptional regional cuisine. With around 280kms of mapped walking or biking trails, Courmayeur is an excellent summer sports destination. There's also a golf course with spectacular views, birdwatching and kayaking. One of the best places to stay in Courmayeur in any season, the Auberge de la Maison is a chic, sloping roofed chalet in a hamlet just outside town with stunning 360 degree views. Its quiet location makes it a great destination for birdwatching. The Hotel Cresta et Duc is a more contemporary option. The decor in the rooms is white and pine, so there's a feeling of clean simplicity. Just off the Via Roma, this is also an excellent choice if you want to be right in the heart of town. 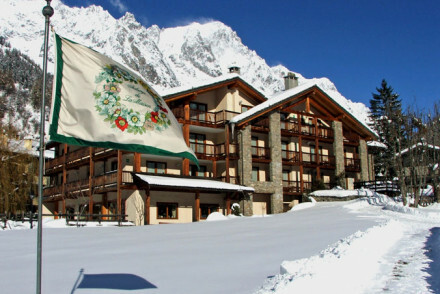 Turin Airport, Geneva Airport and Milan Malpensa airports are closest to Courmayeur. Geneva is around 110kms - via the Mont Blanc tunnel, Turin is around 150kms away and Milan around 215kms. If you’re travelling from within Italy it’s possible to catch the train to Pré-Saint-Didier via Milan. Or you can come via France and Chamonix. If you want to hire a car - which many people opt for to get from the airport to Courmayeur - we recommend you visit our online partner, Rentalcars. If you’re here to ski the best time to visit Courmayeur is during the ski season, which runs from mid-December to about the end of April. But if you’re here to enjoy the beauty of the mountains then spring and summer are perfect. 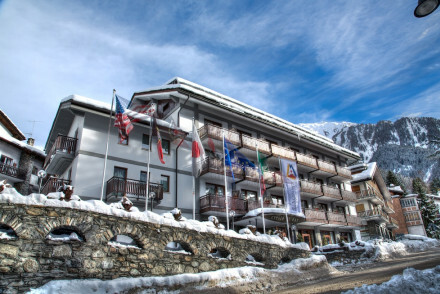 Still not sure which is the best place to stay in Courmayeur for you? 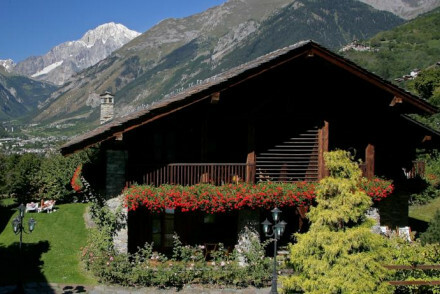 or the best places to stay in La Thuile?